Born December, 1861; educated at Winchester and Jesus College, Cambridge. Mr. Kennedy is one of the best known of our present-day yachtsmen. He is an active member of the Yacht Racing Associa­tion, and a generous donor of valuable trophies for the encouragement of his favourite, sport. He is an active racing owner, and a practical seaman. He started yachting many years ago with the 6-ton yawl Petrel. When experience ripened he acquired the Daring, a 24-ton schooner, and with this as a handy cruiser he contented himself till in 1887 he built his first yawl. This was Maid Marion, which was designed and built for him by Inman. With Maid Marion he won several races. He then bought the Yarana, 72 tons, which had been built by Messrs. Henderson from Mr. G. L. Watson’s lines, and this boat he called Maid Marion, and with her he had many successful seasons. In 1902 he raced the first-class yawl Sybarita, after which he built White Heather. With White Heather (yawl) he captured the 100 Guineas Cup offered by the Royal London Yacht Club for an ocean race from Cowes to the Clyde in 1905, and won the return race from the Clyde to Cowes. 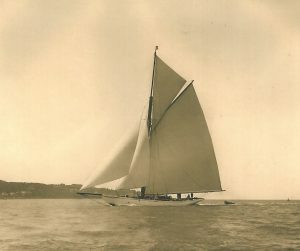 She often beat Nyria in open matches in 1906, after which Mr. Kennedy sold her, and had the first-class cutter White Heather H., built by Messrs. Fife. Mr. Kennedy is Vice-Commodore of the Royal Albert Yacht Club. Clubs: Royal Thames, Royal London, Western of England, Royal Victoria, Royal Northern.